Taste profile from the winemaker: None found. ABC Wines review: Light gold in color and lightly scented with citrus aromas with notes of fresh cut grass, this wine has a strong mineral character on the palate with little fruit flavor. The finish is undistinguished and leaves a slightly odd, almost oily taste in the mouth. Our score: We had this wine with chicken salad sandwiches which tended to improve our overall impression. Still, it's rather expensive for a relatively weak wine. Below Average. 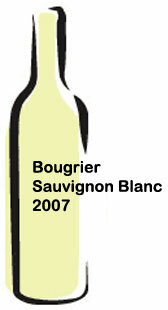 Winery website: Bougrier Vins. This wine is not mentioned on the winery's website.